Joyetech AIO BF Coil Head is available in 0.6 ohms. The 0.6 ohm is the original style of coils included in the Joyetech AIO Kit. This ohm is a great companion for this model as it delivers just the right amount of vapor. It produces a heavy and thick vapor, while still allowing for a discrete vape. The Joyetech AIO BF Coil Heads are made of Stainless steel which is known for enhancing your e liquid's flavor. 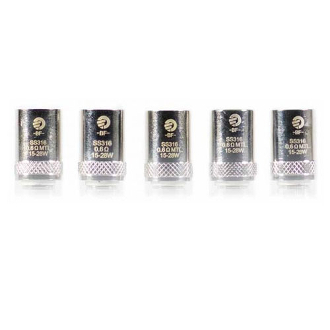 It is also recognized for giving a smoother hit when switching between Variable Voltage/Wattage and temperature control than other coils made out of a different material.